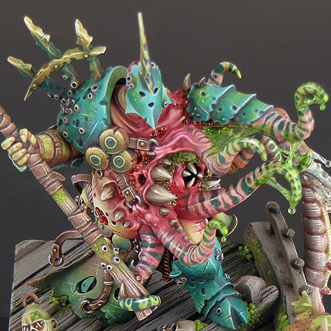 Nurgle has never looked so good! I have actually been watching the progress of this model of the past year. I knew it was going to be awesome when it was done. This definitely has a bright, cartoony vibe to it, but I love it. Normally you see some very dark and dreary paint jobs for Chaos, and Nurgle in particular. Those are great as well, but this just evokes some classic GW paint jobs for me. It's very hard for me to pick my favorite part of the model, but the stripes on the tentacles probably have to claim that honor. They are so unique and well done it's almost insane. 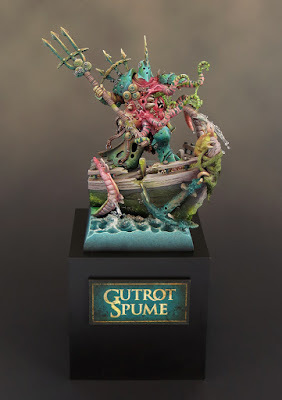 The armor on Gutrot is a great shade of turquoise which helps to reinforce that nautical theme. Speaking about nautical themes, that trident fits the model like a glove and looks very professional. Not only is the miniature itself converted and painted to a fantastic level, but it's display base could almost stand on its own as a mini. 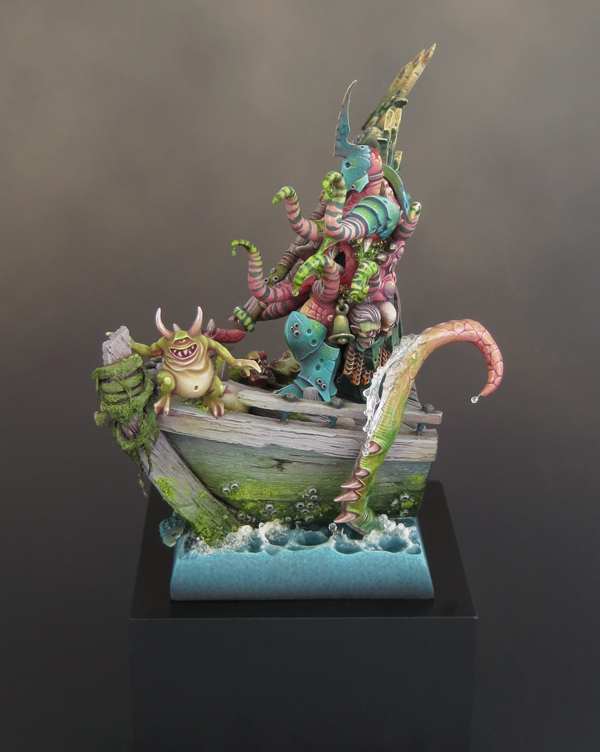 The boat prow has so much character to it, that's not even considering the tentacle emerging from the water. The algae on the wood is a superb touch. He made it by mixing in varying levels of baking soda and sand to get that grainy texture. That is something I don't think I would have ever thought of. The nurgling's paint scheme is another nice point. It's not often you see the cream belly look on a nurgling. It's a very classic fantasy trope, but is usually passed over for demons. 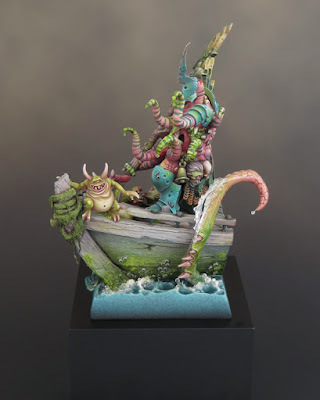 I could just keep going on and on about all of the parts of this model that I love, so instead I'll stop and just highly encourage you to click through to David's own site below to check out even more pictures. 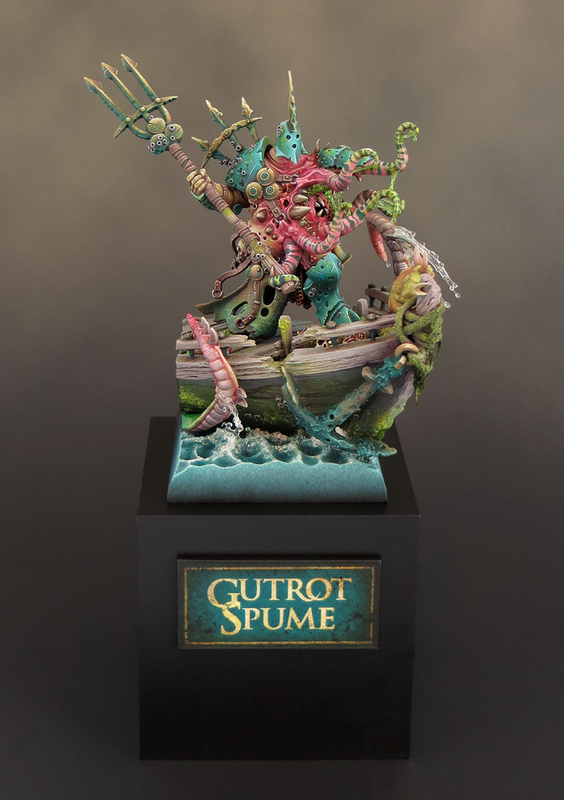 He documented the entire build and painting process for Gutrot, so if you want to know how he did a certain area of the mini just dig through the old articles on the site. Be sure to check out more views of it and a ton of in progress pictures David's website Sproket's Small World show the artist some love if you like it.